Almost 28 percent of US retail banks report fee income from investment sales, but the incidence of banks selling investments varies dramatically by bank size. According to FDIC Call Report data, three-fourths of retail banks with more than $10 billion in core deposits offer investment services. The percentage is even higher among banks with between $5 billion and $10 billion in core deposits. But below $5 billion in core deposits, the smaller the bank the less likely it sells investments. Two-thirds of US banks have less than $250 million in core deposits, but they account for only 37 percent of the banks offering investment services. 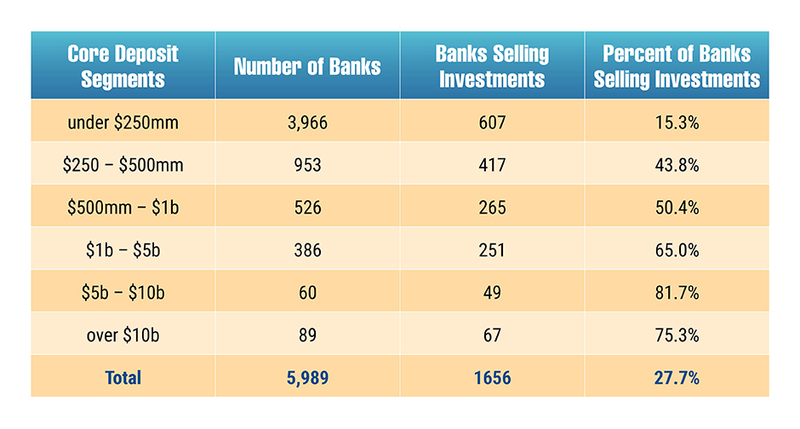 How is the consolidation of the banking industry affecting the size distribution of banks selling investments? Are these banks getting larger or smaller? Find out by obtaining a copy of the Kehrer Bielan 2016/2017 Annual Industry Checkup, sponsored by BISA. Full results are available to BISA members only. For information on how to download the full report, or more information on joining BISA, please contact BISA Staff at (202) 367-2342 or bisa@bisanet.org.